We moved up north to continue with our trawls. 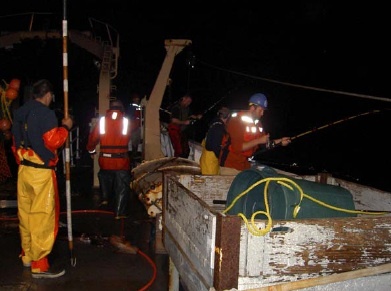 The first night we trawled just north of Monterey Bay. It was a good thing we did because outside the bay, the wind and swells are rough. We saw lots of jellyfish and lots of krill in our catches. However, I would like to talk a little about a very specific group of fish, rockfish. If you read the mission above, you will recall that rockfish are the primary focus of this survey. Therefore, I think they need a moment in the spotlight to themselves. 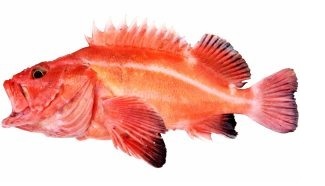 While this number may vary, NOAA has over 60 species of rockfish listed on the West Coast. They are an intriguing group of fish for many reasons. First, it is important to note that they are extremely significant to their food web because they are a prey species, but they are also important as a food and income source for humans. Species like the bocaccio rockfish and the yelloweye rockfish are species of concern due to over fishing, and populations are slow to recover. That is enough reason to learn as much possible about these fish. What we know about rockfish species is they can live for a long time. Many can live over 50 years, some can even live over 100 years of age! 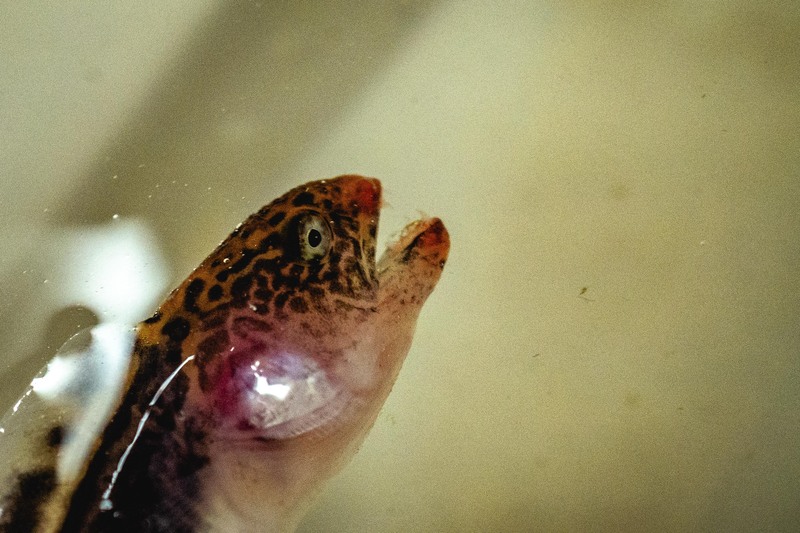 Their growth rate is relatively slow, and very few make it to adulthood because they are prey for other fish. During the first year (sometimes more depending on the species), they spend much of their time in the pelagic realm (open water). 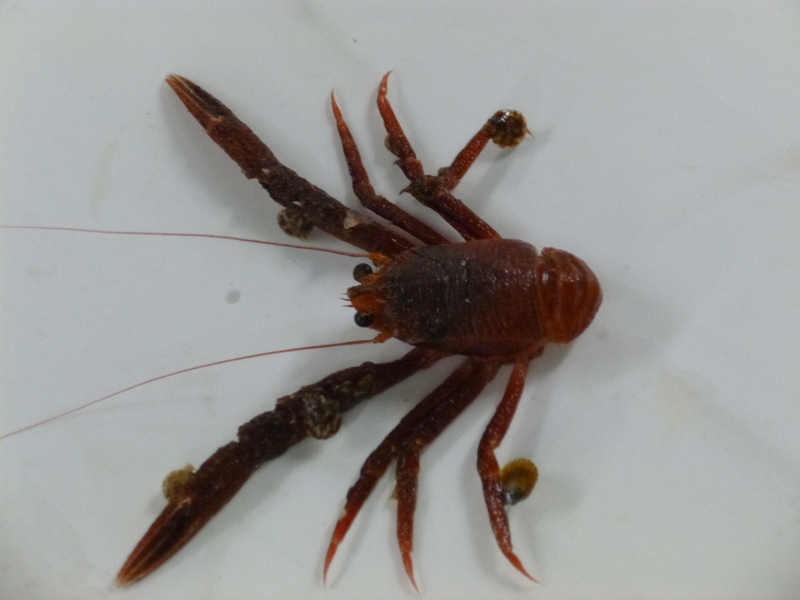 If they live long enough, they can grow to a size that allows them to settle in the benthic zone (ocean floor). For many species, 60 mm is a large enough size to settle. This is what the term “recruitment” refers to. Once rockfish settle out of the pelagic zone, they have a higher chance of reaching reproductive maturity. 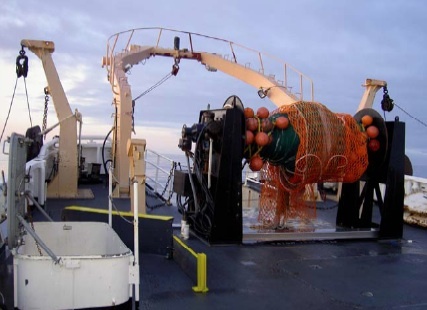 NOAA Fisheries has been surveying the West Coast for rockfish since 1983. They first started in a smaller region from Monterey Bay to Point Reyes, CA. The survey area expanded in 2004 and by 2013 it covered the entire coast of California. The success of the local ecosystem and the commercial fisheries depend on healthy fish populations. The survey tries to collect at least 100 specimens per species of rockfish and take them back to the lab (on land). Back at the lab the species identifications are determined as many rockfish are difficult to identify to species at this life history stage without using a microscope. In addition, their size is recorded and tissue samples taken for genetic studies. 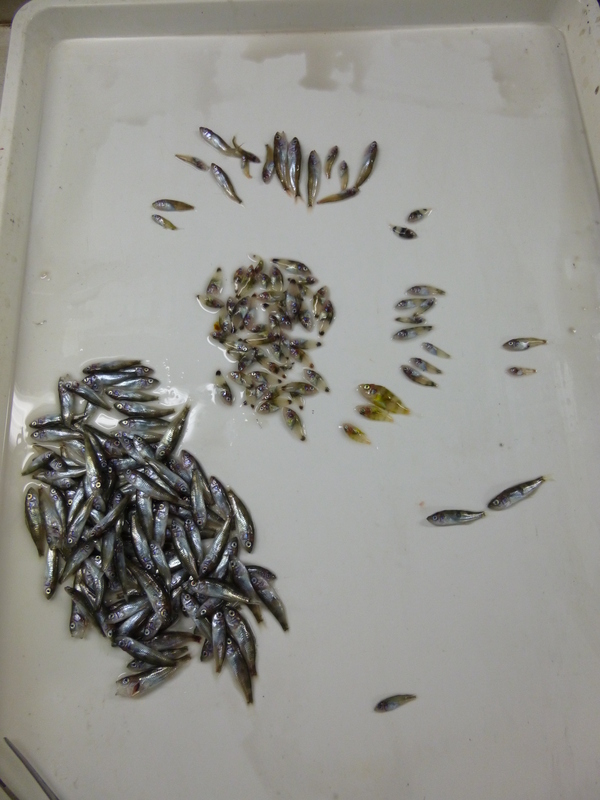 Then, on select species, otoliths are removed to age the specimens. The otolith is an ear bone. 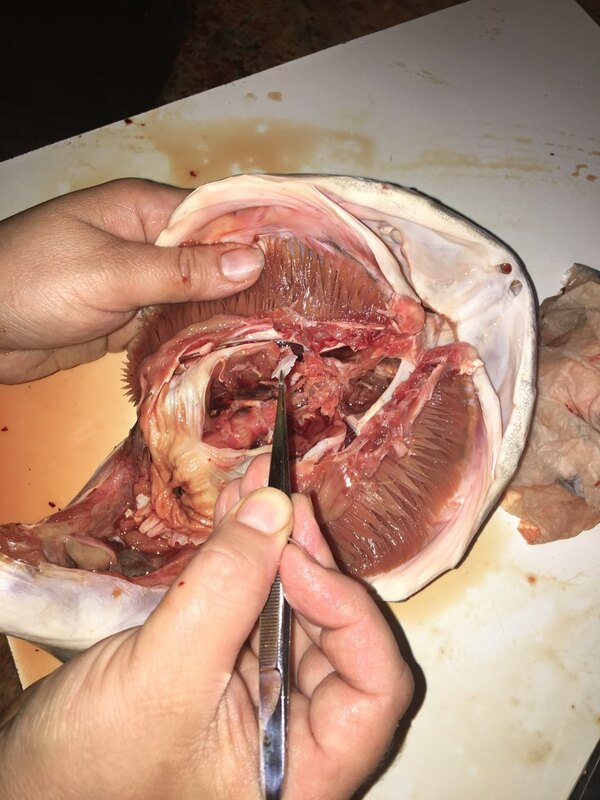 In fish, the ear bone deposits layers of bone in rings. It happens daily and these daily rings can be counted using a microscope to learn how old the fish is. 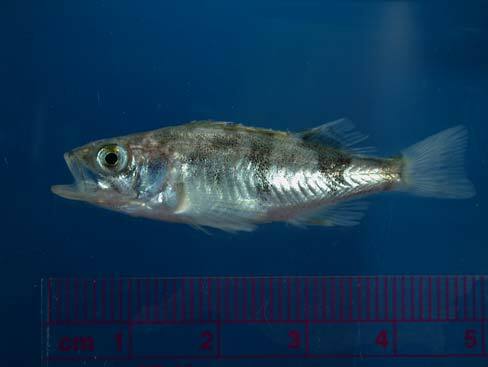 These ages are used by scientists not only to learned how old the fish are, but they can compare this information to the size data collected and estimate the expected size of a fish at any given age. Keith Sakuma has been working with the survey since 1989. He is the chief scientist and team leader of the night crew. He works hard to make sure we are all focused and efficient because it is a fast-paced work environment. In between hauls, he enjoys the company of his team and a few Dragon Ball episodes. He was born and raised in Hawaii, and went to University of Hawaii for his Bachelor’s degree in Zoology. In his younger years, Keith worked for the Division of Aquatic Resources, where he spent his days walking up and down the beach to count fisherman and interview them about their catches for the day. He also did snorkel surveys doing fish counts in fisheries management areas. In addition, he worked on a team that implemented fish aggregating devices, buoys that attract fish for the local fisherman. While at the University of Hawaii, he was part of the Marine Option program where they teach you various marine skills and connect you with marine research activities. Through this program he completed his scientific diving training, and then participated in two diving surveys. Both surveys documented the impacts of tourism on the reef systems on the island of Lanai Island and Molokini, which is a tiny islet off Maui. On Molokini, tourist traveling to the islet by boat, dropping anchor in the reef, caused a significant amount of damage to the reef. Mitigation included the addition of moorings so boats could tie up and not have to drop anchor, destroying more of the reef. For his Master’s, he attended San Francisco State University. 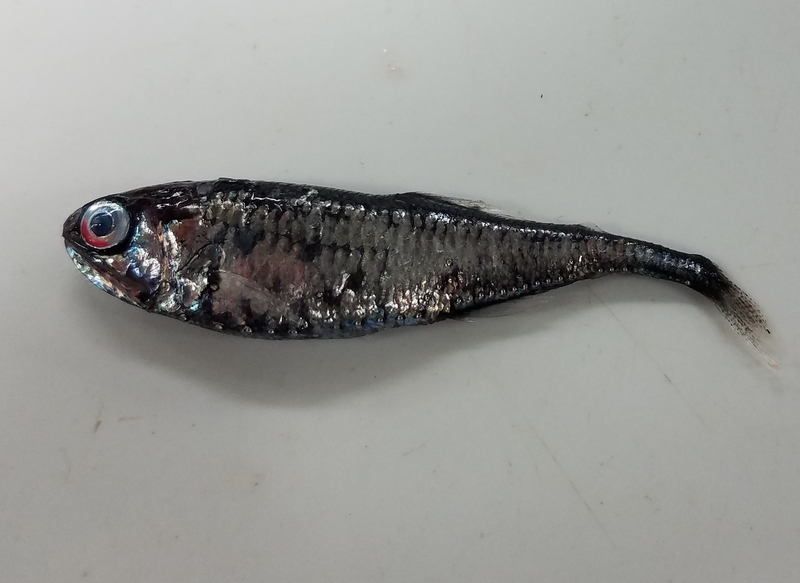 His major advisor just returned from a 2-year sabbatical, working with the National Marine Fisheries Service (NMFS) [also known as NOAA Fisheries] on the mid water trawl survey, and suggested that Keith do his Master’s Thesis on the data he collected on the survey. While finishing his Master’s degree, he was offered a full-time position working with NMFS, and has been here ever since. That means he has 29 years put into this work. Growing up in Hawaii near the ocean definitely influenced his decision to pursue Marine Science. He used to say to others how much he loved the ocean and that the ocean loved him back. He couldn’t wait to spend time at the beach in the water. And while today this remains true, he has mentioned that that cold waters of Pacific Coast are not as affectionate as the warm waters of Hawaii. The water around the islands is so clear, allowing one to see at a distance the beauty that lies beneath. Here, you must pick the right day at the right time to find tolerable temperatures and some visibility. The murkiness makes it hard to see anything, but that murkiness is what contributes to the productivity of the region. Even after 29 years, Keith still very much enjoys being at sea. He doesn’t get sea sick, so he can spend time working in the field with real specimens and real-time data rather than just analyzing data collected by other people. He enjoys seeing new people come on and get excited about the work. For anyone interested in pursuing Marine Biology and any research science, it is important to have a strong background in math and statistics, especially in today’s world. He also mentioned how important it is to have computer skills and programming skills. The software used to process and analyze data requires one to read and write programming language. Having these skills make one a stronger candidate when applying for research positions. It also gives one more validity when having to speak about and defend the analysis of the research. That’s Keith, the Chief Scientist, in a nutshell. I also got to learn more about the rest of the team. Thomas Adams has been working with this survey for 5 years now. He started as a volunteer with NMFS, analyzing marine chlorophyll samples. He always had an interest in Marine Biology, and already had a connection to someone working in a NOAA lab. 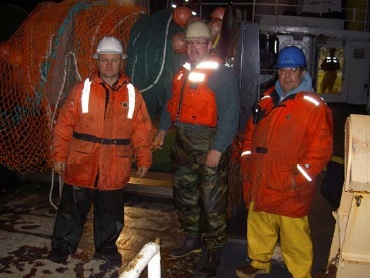 He was invited to work on the rockfish survey because he was known for being a knowledgeable and efficient worker. He too is very enthusiastic and really enjoys being at sea with Keith and the rest of the team. He is the main provider of Dragon Ball, and the Simpsons, which the team enjoys in between trawls. He recently completed his Bachelor’s degree and plans to go for his Master’s in Marine Biology in the near future. Melissa Monk is a Research Mathematical Statistician, and is responsible for fisheries stock assessments for West Coast near shore ground fish. She also participates in research related to improving fisheries. Her schedule is on a bi-annual cycle. One year is devoted to stock assessment, and the next year is devoted to research. During stock assessment years, there is a mad dash that happens around September to learn anything and everything about your assigned species. At the end of the assessment season, there is a week-long panel review of all the data gathered during the assessment. Once the assessment is approved, the information is used for species management and harvest regulations. She received her undergrad in Wildlife Sciences with a minor in Statistics. Her Master’s was in fisheries. She spent half her year monitoring the sea turtle populations in North Carolina, and the other half of the year in classes. She did a lot of quantitative work, research, and recruitment training for her Master’s. She also had a connection to NOAA because her PhD advisor at LSU used to work for NOAA. She learned that NOAA trained people to become stock assessors, and pursued fisheries as a career. Her favorite part about working for NOAA is that her work directly impacts fisheries success. Rebecca Miller is a GIS Specialist, works on a variety of projects at the Santa Cruz NOAA lab. One project is the spatial mapping of rockfish and other marine species. She maps California fisheries catches in both time and space, and is able to analyze this data as far back as the 1930’s. Her Master’s degree is from Oregon State University in Fisheries Sciences with a minor in Geography. She knew since 6th grade that she wanted to be a Fisheries Biologist. She participated in internships and part-time summer jobs in freshwater salmon fisheries, marine intertidal work, and geodatabase management. She loves the people she works with, and the fact the work is so diverse. There is a lot of field work, lots of data analyses, and different projects to work on. She too enjoys knowing that her work helps to sustain fisheries to be both utilized and conserved. Stephanie Oakes is from NOAA Fisheries Office of Science and Technology (OST). She got her Ph D. in Marine Sciences, and worked on Antarctic krill in an ecosystem context. The rockfish survey is similar in the sense the it also surveys species in an ecosystem context. Being able to participate in surveys like this is important to her because she gets to experience first had what happens during the surveys and how the team operates. 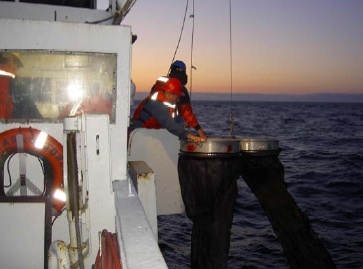 Her personal gratification is that she gets her hands in the catch, in the field like she did for her Ph.D. NOAA Fisheries OST is there to advocate and ensure sound scientific basis for NOAA Fisheries science programs and resource conservation and management decisions. Krill. 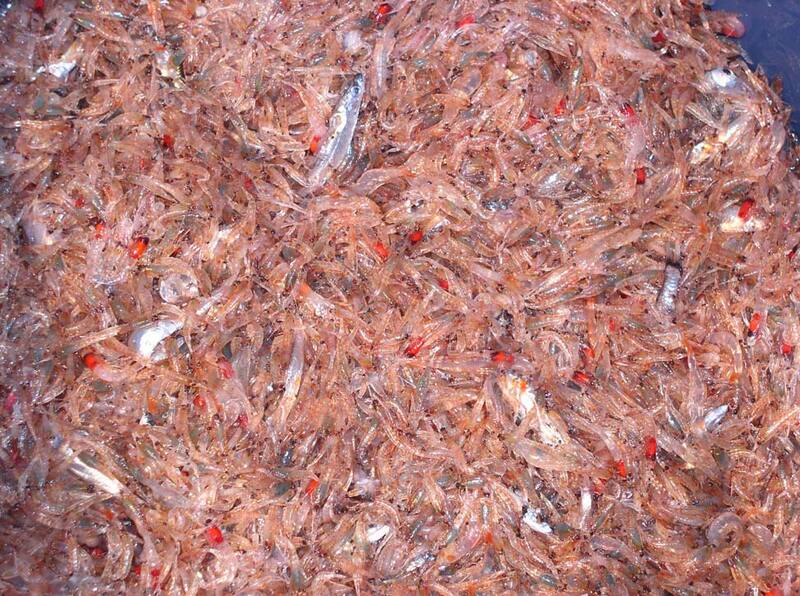 There is mostly one species of krill here, but we’ve seen multiple species in our catches. One time, I had the chance to visit California for a conference, and I got to dip my feet into the Pacific Ocean. It was so cold! In less than a week I will be surrounded by Pacific waters as I set sail on NOAA Ship Reuben Lasker for 12 days. The anticipation has been building since I learned of my assignment, and now the time has finally come. 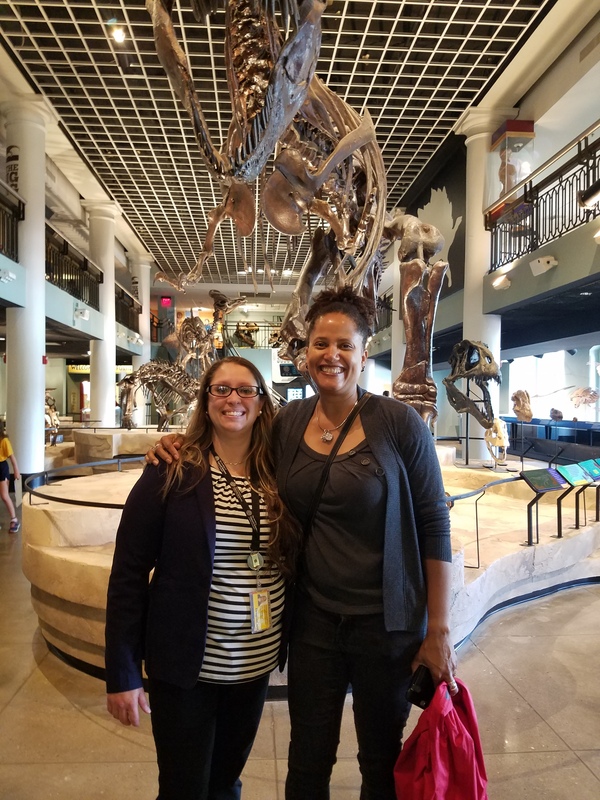 My name is Kimberly Godfrey, and I am the Coordinator of the Women In Natural Sciences (WINS) Program at the Academy of Natural Sciences of Drexel University (yes, that it a mouthful). The Academy (1812) is the oldest natural history research institution in the Western Hemisphere, and WINS just celebrated 35 years. 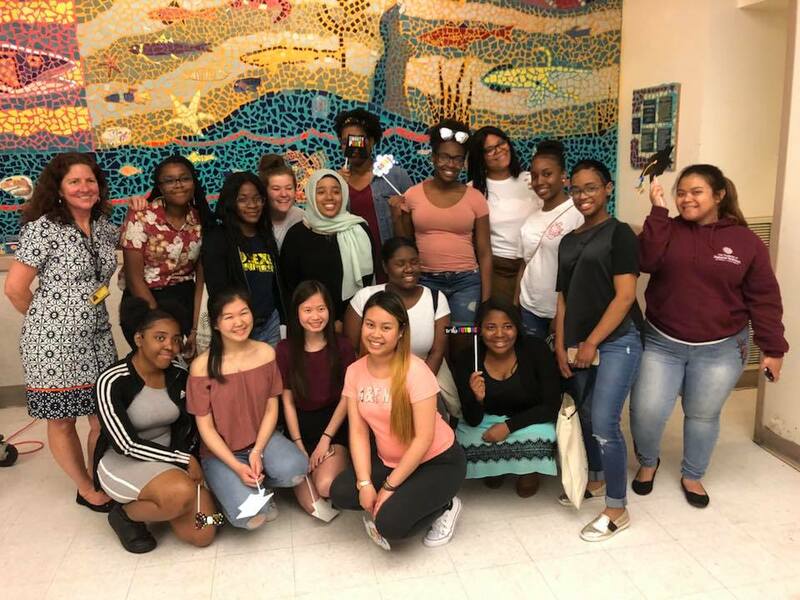 WINS is a science enrichment, after-school program for high school girls in public and charter schools in Philadelphia. Our goal is to provide opportunities for exposure to the natural sciences in ways the students cannot find in the classroom. Our long-term goal is that they take what they learn and turn it into a career. 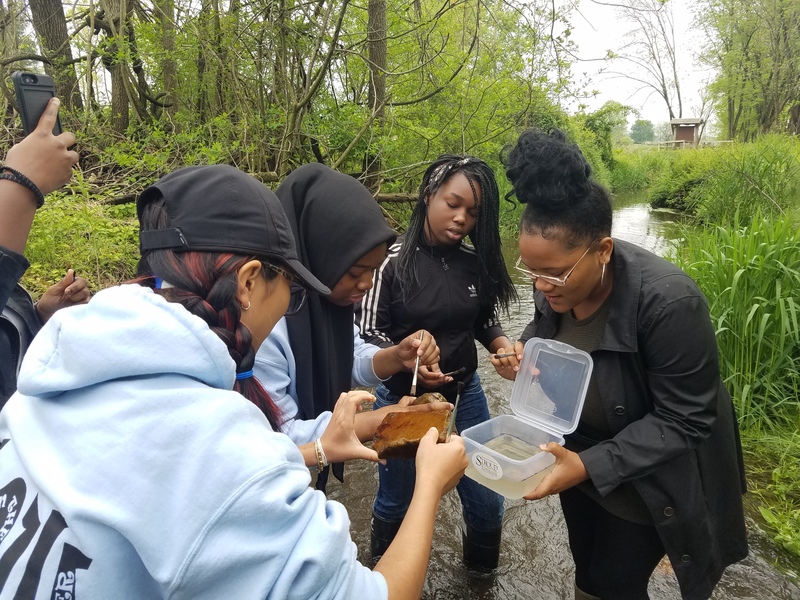 Most of our participants have had little to no real-world, hands-on science in the classroom, and they share many first-time experiences with the WINS staff and other participants. 2018 WINS Senior Farewell. Of our 15 graduates, 12 are pursuing STEM majors and careers! That’s my favorite part of being a WINS girl. I can share my experiences and my knowledge with them. I have a degree in Marine Biology, and had the opportunity to participate in marine mammal research for 2 years. I taught about environmental science and wildlife conservation for 10 years prior to working at the Academy. And, something that is important to me, I am a Philadelphia native who, like these young ladies, knew little about my urban ecosystem while growing up in the city (the only eagles I ever saw growing up were the Philadelphia Eagles, you know, the 2018 Superbowl LII Champions! You may have heard it a time or two). It wasn’t until I returned from college that I began to explore the world right under my nose. Now I help them explore the wildlife in their backyard, and then push them to branch out of the city, the state, and even across the globe. Over the past few weeks, I found it difficult to refrain from talking about my upcoming trip. I shared the information I’ve learned so far with some of my girls, and each time I share something new, they become equally excited to follow my adventure at sea. I met with one of the Academy’s fisheries scientists, Paul Overbeck, to learn how to remove an otolith. Some of my preparation stories have led to a lot of joking and humor. 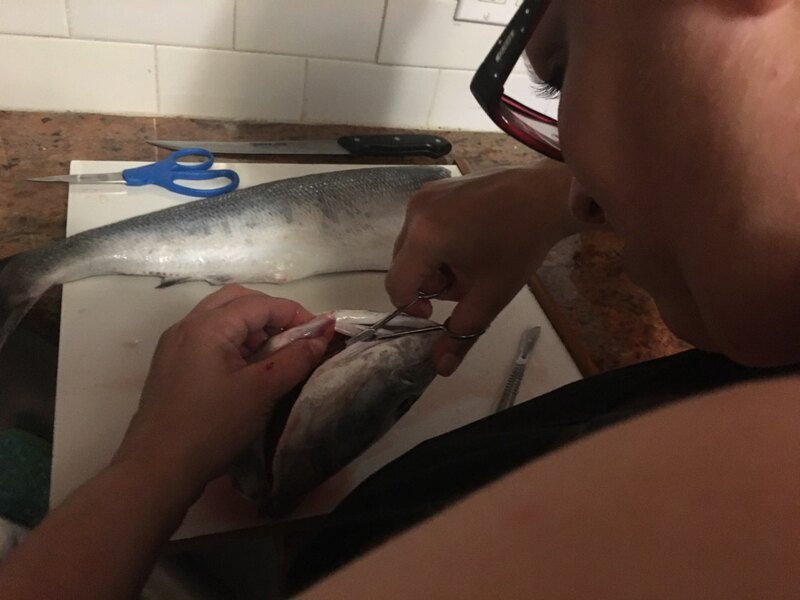 For example, trying on every pair of waders, boots, and waterproof gear that we have, all of which are too big for my size 5 shoe and my 5’0” height; how my freshly caught blue fish dinner turned into a dissection in my kitchen as I practiced removing the otoliths; or how I randomly had the opportunity to meet Sian Proctor, 2017 TAS participant and face of the 2018 TAS application (she happens to be friends with one of my co-workers)! All of this leads to one very anxious and excited woman ready to set sail. Practicing how to remove an otolith on what was supposed to be my dinner. Beginning the process of removing a blue fish otolith. Small world indeed! I had the chance to randomly meet Sian Proctor, 2017 TAS Participant. Quite a few of our girls wish to explore Marine Science as a career, so my plan is to absorb everything I can and bring it back to them. I want them to know the importance of this research, and that this career is truly an option for any one of them. One day, I would love to see a WINS girl aboard a NOAA research vessel, dedicating their careers to the understanding and stewardship of the environment. That’s what NOAA’s mission is all about! Scientists working with NOAA and the Southwest Fisheries Science Center have been conducting surveys along the California Coast since 1983. Along with rockfish (Sebastes spp. 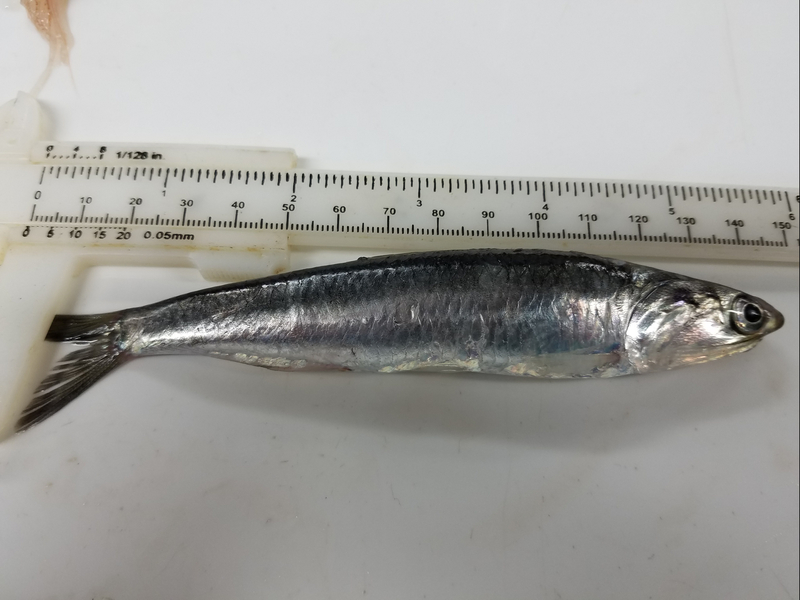 ), they’ve been collecting abundance data and size information on other species including Pacific Whiting (Merluccius productus), juvenile lingcod (Ophiodon elongatus), northern anchovy (Engraulis mordax), Pacific sardine (Sardinops sagax) market squid (Loligo opalescens), and krill (Euphausiacea). The information gathered from these studies is used to examine recruitment strength of these species because of their economic and ecological importance. The weather has again had an effect on the scheduled research tasks. As the week went on the weather deteriorated so that some nights we could only do one trawl before the waves crashing over the aft deck made it too dangerous to be out there. 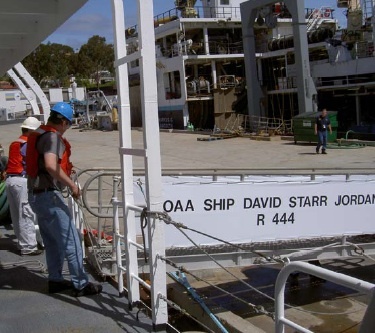 Safety was the primary issue in everyone’s mind on the ship – bridge officers and the scientists discussed weather conditions and forecasts and the deck crew were careful to point out safety concerns involving equipment or wearing protective clothing. Even with the ship feeling like it was doing a wild tango at one point, I felt very secure. Last night was a complete wash as far as doing the scheduled work. By evening the ship officers decided to stay out the night in Drake’s Bay since the peninsula would give some shelter from the wind and waves. 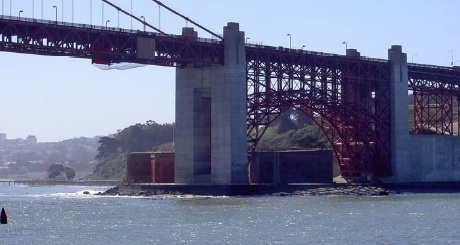 We used the time to prepare for a new group to come aboard in San Francisco, cleaning our staterooms and doing laundry. The bongo plankton tow ties in with the squid sampling in an interesting way. 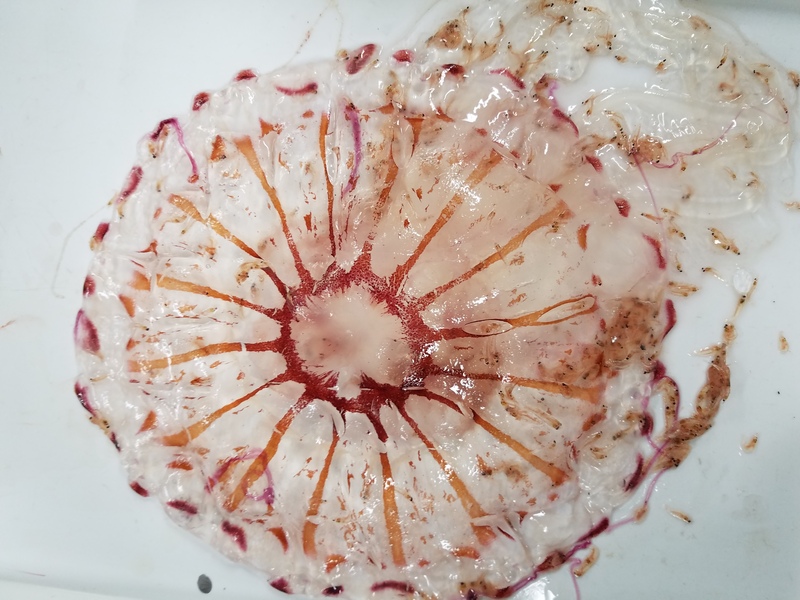 It shows how all of the research coordinated on the DAVID STARR JORDAN this cruise (and really all NOAA projects) is working towards understanding what life is like in the ocean and how the distribution of organisms is changing. 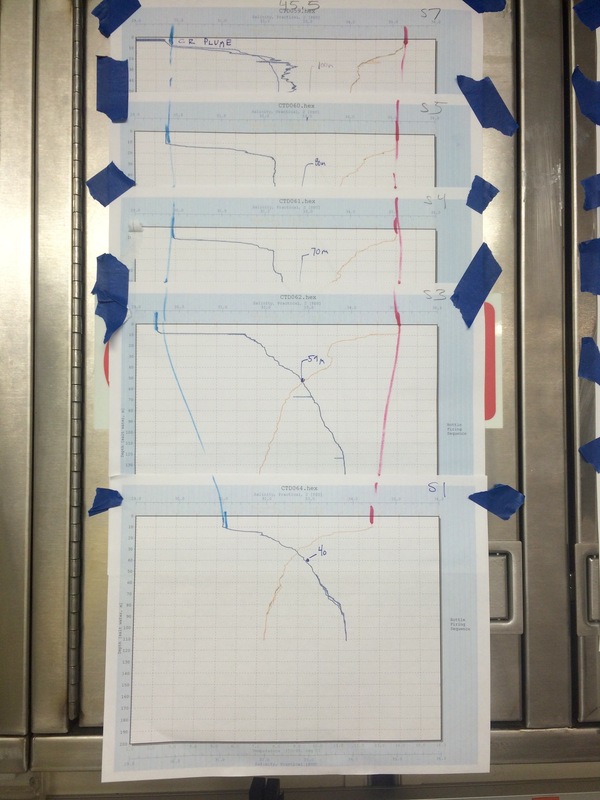 One plankton sample from each bongo tow was preserved in ethanol. The other sample was preserved in formalin (a formaldehyde solution). The rationale behind this was that formalin denatures or destroys the structure of an organism’s DNA. The ethanol sample could be used to do genetic testing. 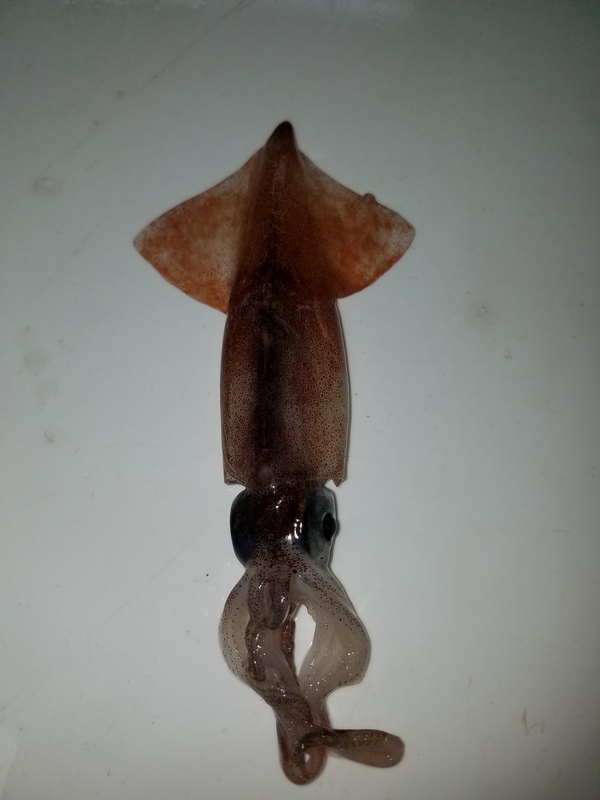 When the samples are examined back in the lab, the researchers are hoping to find paralarvae of the Humboldt squid in the same location as the adults collected this cruise. This would give credence to the idea that they are now breeding off the coast of California, rather than in the tropics as has been the accepted understanding. Bill and Robert (two of the volunteers on this leg of the cruise) had great questions while Ken was explaining this part of his research. Bill (and the others) had been using a fluorescent lure to “jig” for squid. Squid are attracted to the bioluminescence found in some ocean animals, like the “headlights” on a California Headlight fish. 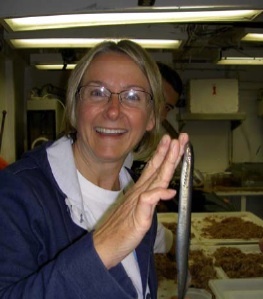 NOAA Teacher at Sea Sue White shows how gripping life at sea can be. He asked if the squid are caught in the nets because they are hoping to feed on the small fish being concentrated there. His hypothesis was to see if luminescent lures in the net would increase the number of squid caught. Robert asked about using radioactive isotopes to label squid and then look for the radioactive label in the paralarvae as a way to see patterns in breeding. Such intriguing thinking. I was not alone in wanting to be awake for our entry into San Francisco Bay. We enjoyed a hot breakfast for the first time in days (and for some the first time ever on the ship!) and were invigorated by bright sunshine. Well, the sun seemed bright through the San Francisco haze after being on the night shift! Everyone was outside by the time land was sighted and we enjoyed watching the Golden Gate Bridge get closer. For days I had not noticed much traffic at sea (especially at night) so it felt like driving into a major city in that the traffic kept increasing the closer we got to the Bay. Huge shipping barges and small personal sailboats were all out on a beautiful Saturday morning. The map distance from Drake’s Bay was not far, but our speed entering the bay was such that it took several hours to get around the bend and in to where the piers are in San Francisco. Just as in leaving San Diego, the ship officers were busy piloting the ship to its place at the pier. 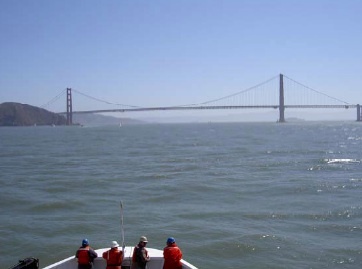 Staff from the Santa Cruz lab were waiting to help offload specimens, some ship personnel were already off duty and looking forward to a day in the city, and my husband was patiently waiting on the pier to hear my stories of life at sea. After almost two weeks at sea it was interesting to adjust to life on land. I did feel the ground moving as I walked and especially felt phantom ocean waves when I tried to sleep or take a shower (no grab bars to steady yourself on land though!). The sounds were so different too with less of the ongoing sound of the ship engine or the air system in my stateroom and more collective noise of traffic and airplanes. I had missed the simple sounds of my backyard birds, but did not notice this until I realized how wonderful the familiar can sound. I am brimming with new information and connections to make with classroom labs and activities. I (and my husband) can hardly wait until school starts so I have a new audience for my Teacher at Sea stories. Think about the area where you live. How many people in your neighborhood can you name? List the types of dogs that live in your neighborhood, too. How many insects can you identify? Can you name specific types of one kind of insect? In other words, can you tell the difference between a monarch and swallowtail butterfly? What about a skipper and a sulfur butterfly? Scientists, from experience, can name an incredible number of organisms. Often they can even give the scientific name for exactly one species that differs only slightly from another. You can also increase your naming ability with practice… what would you like to become an expert in identifying??? What mysteries will I see next? Joao Alves treats us to squid and salsa, Brazilian style. We have a pattern down for the nights now. The scientists, deck crew and bridge are seamless in their coordination of a trawl. Everyone knows their job now and down to who turns the deck lights off once the nets are in the water seems to be done intuitively. As soon as the nets are brought in, the sorting starts. Big fish, or worse the big jellyfish, are caught as the nets are being rolled up. Some fish and the jellies are measured and added to a database by location. Jellyfish are especially hard on the nets because of their weight. If they become too plentiful, trawls can be cancelled to keep the nets from being destroyed. The fish are more familiar by now. The Myctophid and Headlight fish looked so similar at first, but now I can see the two bioluminescent dots between the eyes on the Headlight fish. 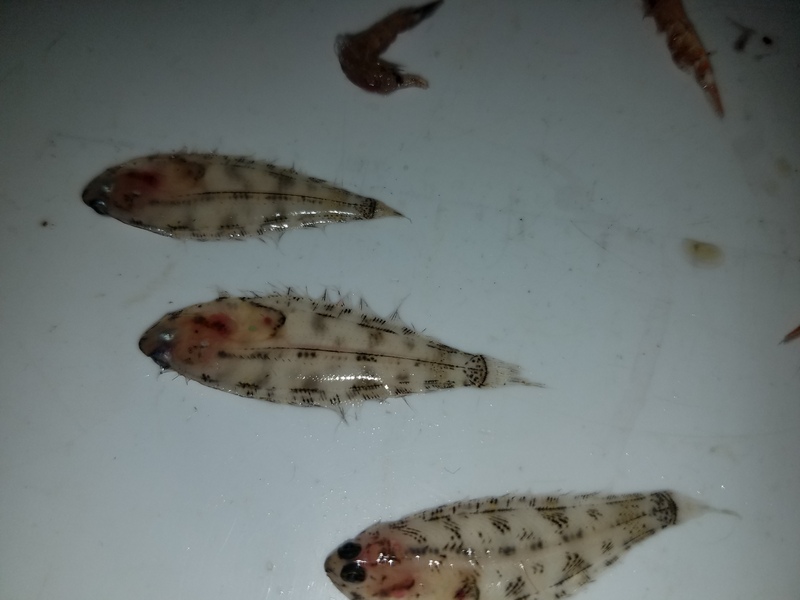 With more experience, it became even more obvious that there were many differences differences, but harder when they are hidden behind the more generic krill, or in the case of tonight’s haul, the pinkish shrimp. 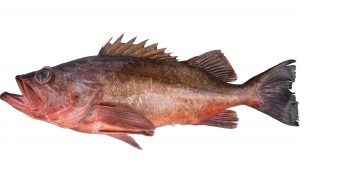 The rockfish (Fig. 4) also have to been identified as separate from other fish also similar in size and color. Side by side it is easy to see that these fish that are both dark in color. The waves just keep getting rougher as the cruise progresses. The motion onboard varies with different activities. The bars to grasp in the shower and at various places around the ship are very practical, to say the least. Sleep is an interesting process where you can wake up with tired muscles from trying to keep yourself in place! Those with more experience have said that it is physically tiring to be onboard and that we should expect to need more sleep. It is amazing how I have adjusted to sleeping during the day now. The volunteers have been great to work with. They are now bringing their music down to play as we sort the catch from each trawl. It is fun to hear the eclectic playlists they have. I have also been impressed with how well-read they are. We have been able to talk about books that range from Steinbeck to environmental awareness. They also enjoy the oddities we find on our sorting trays… anything with suckers must be stuck on your finger to see how long it will hold on (little squid or octopi require peeling off!) One night we had double tailed fish. Somehow several of the fish that night managed to get one head caught in the other’s to the point that it looked like the head was in the center with a tail going off each side. Can you find any animals that are not fish? 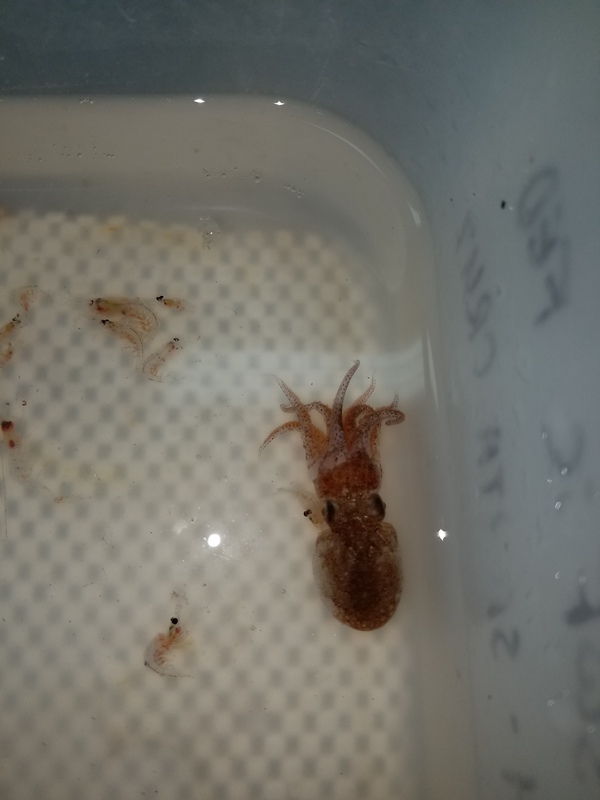 We found tiny squid and octopi most nights. Squid tended to have really big eyes for their overall size. Most of what you see in Figure 2 is krill. Describe what makes the juvenile rockfish different from the sand dab shown above. This is the second night of collecting data for this leg of the cruise. Last night was a real learning curve for those of us new to the work involved. 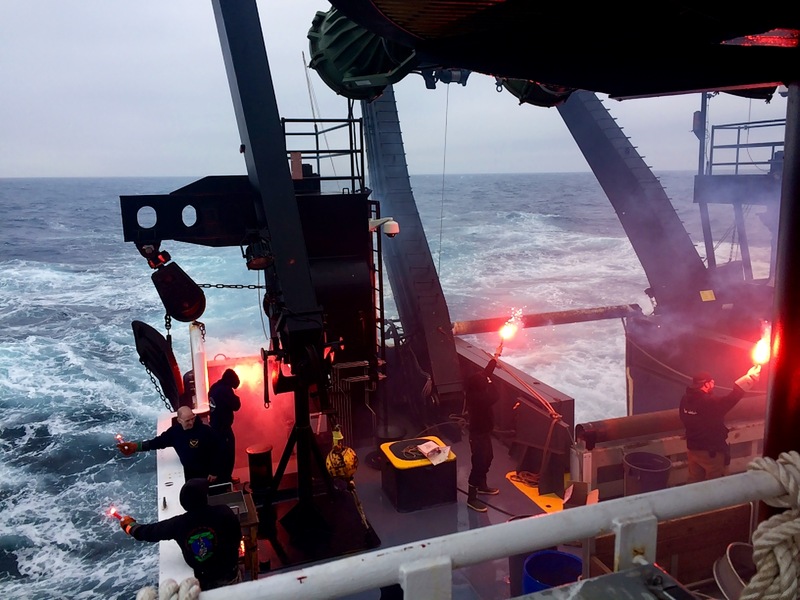 As soon as they were aboard, the scientists in charge of the rockfish survey (Ken Baltz – the Chief Scientist, Keith Sakuma, and Brian Wells) were busy organizing equipment so they could begin at sunset. Each night the plan is to start by gathering plankton using the bongo nets. The plankton is processed and preserved for later study back at the scientist’s lab in Santa Cruz. CTD (conductivity, water temperature, and depth) data is gathered throughout the day and night, and on the first night there was an electronics problem between the collection equipment that goes into the water and the computer. 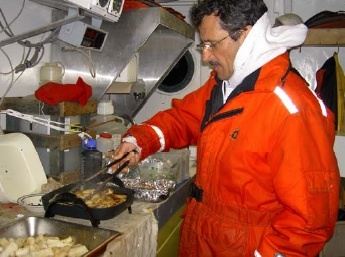 Since weather has become such a factor on this cruise, the scientists did not want to lose any opportunity to gather data or specimens. After sunset, the main focus through each night is to conduct mid-water trawls to collect data on fish populations and preserve samples for later study. All of this data goes into an ongoing database. Each volunteer had specific jobs associated with the different specimens or data being collected throughout the cruise. Figure 1 shows how Robert Cimitile and Bill Matsuba worked the bongo nets. Gabe Singer was responsible for the CTD readings throughout the night shift. 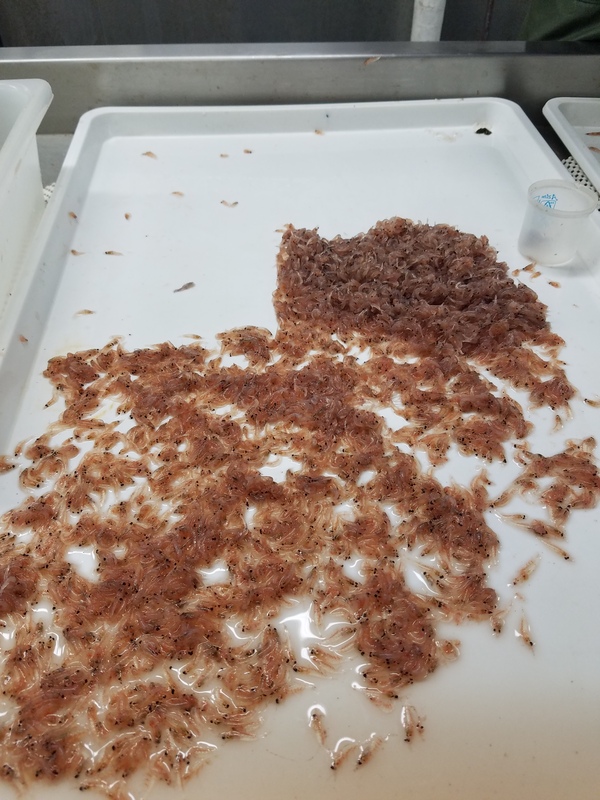 Ben Gire sampled krill from each trawl for a separate Euphausia study, checking for species type and numbers of gravid (“pregnant”) in an area. We all worked to sort the catch from each trawl. 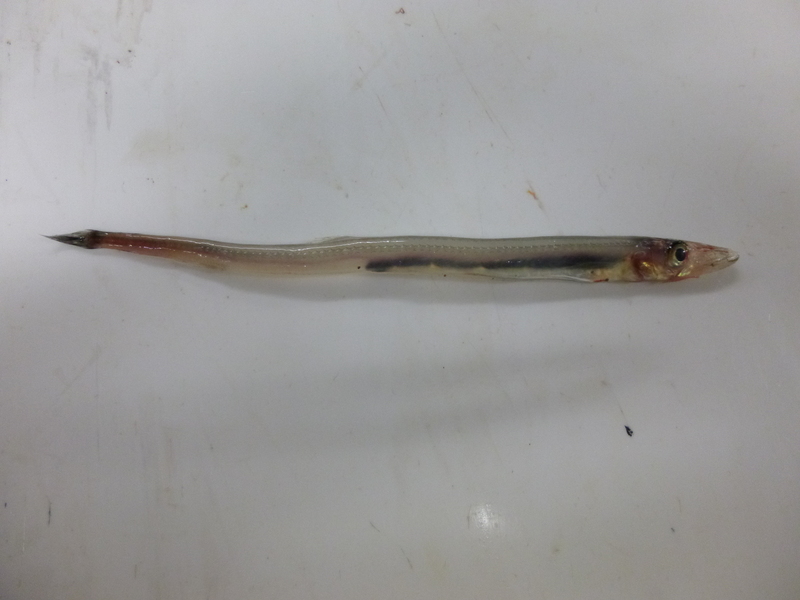 Last night there were a number of midshipman fish in the catch. 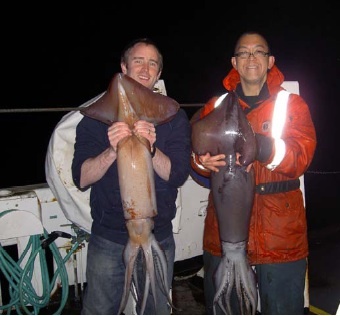 Tonight there is a different sort of excitement since we are finding large numbers of Humboldt squid in the nets. These are processed for other research groups who are studying stomach contents and establishing the squid’s genome. Between trawls the deck crew, scientists, and volunteers “jigged” for squid using fluorescent jigs on fishing line over the port side of the ship. It was impressive to see the live squid and their reaction to being out of water. Their chromatophores pulse and change colors while they hiss water out of their siphons. Some also spray ink in the process. 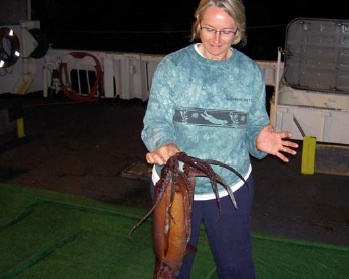 Sue White, holds a live Humboldt squid! These squid are huge compared to the tiny Gonatus or Loligo squid we have seen. The main fish being surveyed is the rockfish. They are few in numbers and when we do find one, it is placed in an ocean water ice bath to maintain them until Keith identifies them by species. This is also part of an ongoing, year-to-year survey to establish their distribution and numbers up the coast of California. Since they only come up to feed at night, they are the reason the trawls can only be done at night. It has been impressive to see the teamwork involved with working the cranes for the bongo nets and the CTD equipment, as well as the pulleys involved with the gates, and the trawlnet reel located on the gantry on the aft deck. Radio communication between the deck crew, the scientists, and the bridge starts each operation. The deck crew manipulates the equipment and the scientists and volunteers assist in positioning. They all have a part in collecting the specimens as they are brought up. The bridge officers maintain the course and speed of the ship for all operations and also are vigilant about safety on the aft deck. They maintain contact with the radio and also have visual contact with cameras. I feel rested tonight, but not quite used to working a night shift! Last night was the first time I think I have ever been awake for 24 hours, so my bunk looked wonderful this morning. It was easy to sleep through the day after being so tired and now it is beginning to seem more normal to work at night. The squid are amazing the animal unit. Seeing them alive and then being able to witness their dissection just a short time later was a singular experience that I will retell each spring now for my students. Joao, one of the fishermen, showed me how to hold the live squid behind their eyes so the arms would not “get me”. After seeing how they can latch on to fish even in the trawl net and how their beaks mince those fish, I have even more appreciation for what these animals can do as a predator! I am learning how to recognize and name a great diversity of pelagic animals. It has been an intensive learning curve for me in the last day (or should I call it night?) but I am starting to see the pattern of the trawls and it is very interesting to see how they vary according to transect location and even distance from the coast throughout the night. How has the weather changed since my last log (Monday at noon)? Calculate the differences in wind speed and temperatures. Has the ocean salinity changed? Is the pressure rising or falling? Do the temperature changes seem reasonable considering we have traveled north and the time of day is later? 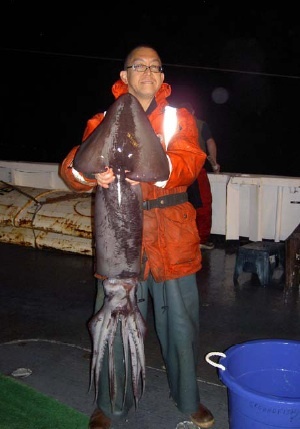 The Humboldt squid are very well adapted for these conditions. Would you be comfortable swimming in this water too? 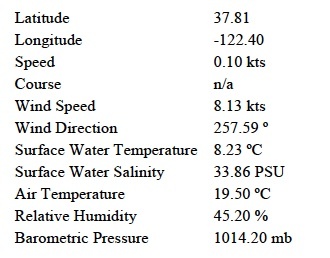 The wet lab’s wind direction and wind speed instrumentation. Original to when the ship was built in the 1960’s?? GMT = Greenwich Mean Time, international time which is the basis of time in each time zone around the world. Greenwich, England is located at Longitude 0° 0′ 0″, Latitude 51° 28′ 38″N (North of the Equator) or where the east meets the west. The DSJ is on Pacific Time which is 7 hours earlier. Latitude is the distance the DSJ is north of the equator, expressed in degrees (or hours), minutes, and seconds. Longitude is the distance the DSJ is west of the prime meridian which runs through Greenwich, England, expressed in degrees (or hours), minutes, and seconds. (Ship) Speed / Wind Speed refers to how fast the ship is moving or how fast the wind is blowing. 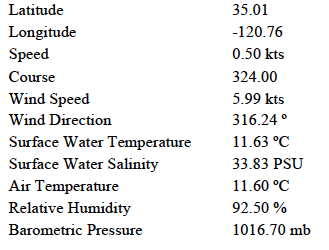 Speeds on water or in the air are measured in knots (kts). One knot is one nautical mile per hour. A nautical mile (6076 feet) is a little longer than a mile here on land (5280 feet). Use this conversion factor to change speed in the weather data to speeds on land: 1 knot = 1.16 mph. Here is a fun visual that connects wind speed in knots to our more familiar miles per hour. It also gives a more qualitative description of what different wind speeds are like. 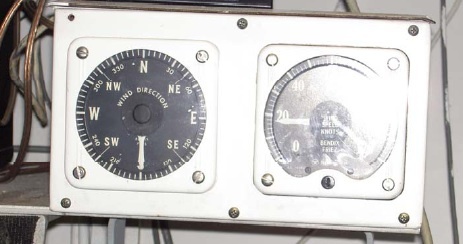 (Ship’s) Course refers to the direction the ship is traveling to and is based on a 360o compass. Wind Direction refers to the direction the wind is coming from. It is also based on a 60o compass. 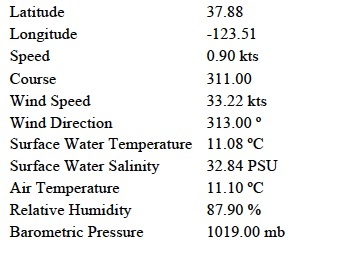 Surface Water Salinity simply stated, describes how salty the ocean water is at the surface and can be referred to in PSUs (Practical Salinity Units). It is based on the understanding that the electrical conductivity of seawater is related to its salinity. A special conductivity meter is used at sea and the PSU value is calculated from the data. PSU is not a unit of measurement, but a calculated value. The average world ocean salinity is around 35 PSU. Relative Humidity is a measure of the amount of water in the air compared with the amount of water the air can hold at the temperature it happens to be when you measure it. At the temperature given in the weather data above, the air has 71% of the moisture it can hold. If the temperature decreases while the number of molecules of water is the same, then the relative humidity would increase. The cooler air molecules are closer together and cannot hold as much water between them. Barometric Pressure is the force the atmosphere is exerting on a given place, measured by an instrument called a barometer. Think of it as being the “weight of air”. Air pressure is recorded onboard using the unit mb, which stands for millibar. A millibar is 1/1000th of a bar. A bar is a force equal to 100,000 Newtons pressing on a square meter. You can feel the change in pressure in your ears when you are flying in an airplane. High pressure usually means good weather and dropping pressure means the weather is changing. Low pressure often brings precipitation. Vlad and Sam prepare to lift our link to land. After being in port since Friday, the ship officers and crew are busy with a flurry of preparation to be at sea again. Bags of groceries were brought aboard this morning while a steady stream of people came aboard too. The ship went from being asleep to bustling in a matter of hours. Engines were started and soot flakes billowed. Deck crew began the tasks of taking up the walkway and casting off. Ship officers were stationed on the port side (left hand side if you are facing towards the front of the ship) to report ship positions as we began to move away from the pier. We headed out to sea, passing what looked like a series of empty boat slips. As we got closer I could see dolphins there and trainers were putting them through their paces. The ship’s electronics technician, Kim Belveal (U.S.Navy, ret. ), explained that this was a Navy training facility and the dolphins were trained to do very specific tasks, often tasks that reduced risk to people. We passed a Coast Guard ship truly under sail, rigged with huge sails. The lead fisherman, Jose’ Coito, has a son who is in the Coast Guard. He proudly told about his son’s training on that grand ship. It has been a whirlwind time in the last week for me. I gave my last final exam for the school year on Friday morning, wrapped up the last details for school that afternoon, and headed home to pack. Since the last leg of the cruise was cut short, my travel plans changed within the last few days as well, meaning that I was going to be a NOAA Teacher at Sea one day earlier than planned and flying to a new destination as well. I flew to San Diego on Sunday and got to the ship Sunday evening. After settling into my stateroom, I felt a little like Goldilocks walking around the ship and making myself at home. It was very quiet, but eventually I met the ship’s electronics technician and Sam Brandal, an able fisherman, who had also just arrived on the DAVID STARR JORDAN to fill in for someone on vacation. It has been nice to have some down time to make the transition from school to my time as a Teacher at Sea. I spent today on the fly bridge with my binoculars. Chico Gomez, the chief bosun (also spelled boatswain), and Jose’ helped me spot whales on the horizon. 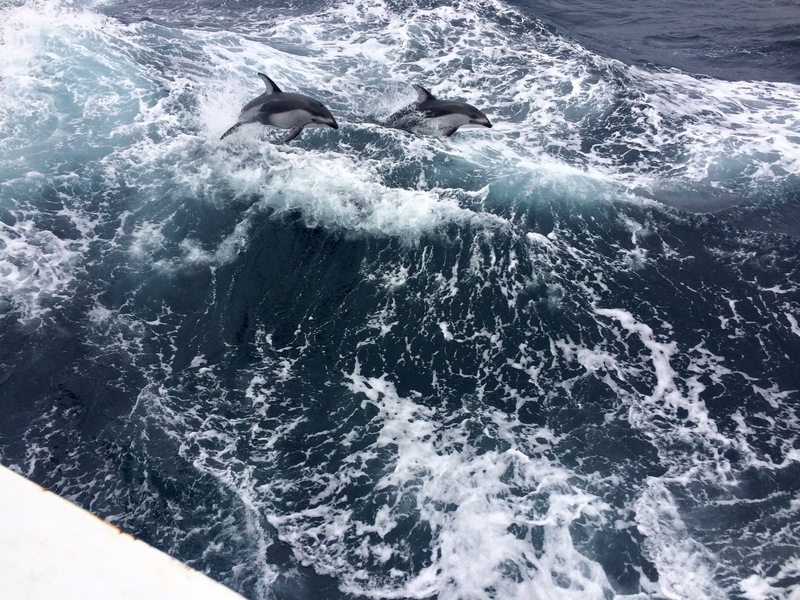 I also saw seals and dolphins closer in to the ship. Sea jellies which ranged in size from about 2” to 10” floated by from time to time. Work starts tomorrow when we pick up the scientists at Avila and do the first transect schedule for this leg of the cruise at Point Sal, CA . . .
Here’s a quote from Rachel Carson that pretty much sums up what it’s like to look off the side of the ship: “We can only sense that in the deep and turbulent recesses of the sea are hidden mysteries far greater than any we have solved.” What mysteries will I see?